Charlotte Betts has written two highly acclaimed novels set in Restoration England, and a collection of romantic short stories. She and Susanna share a love of the seventeenth century, and both aim to capture the vibrant, uncertain excitement of those heady times. 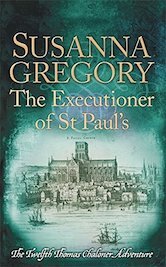 I’m delighted to have the opportunity to interview Susannah Gregory, author of 18 medieval mysteries and 8 murder mysteries set in Restoration London. Susannah, what made you choose the medieval and then the mid-seventeenth century periods for your murder mystery novels? I wrote the first Bartholomew book so long ago now that it’s hard to remember what prompted me to pick the mid-fourteenth century. However, I’ve always loved medieval history, and I think I just chose a time where a lot was happening. There were the wars with the French, and then along came the Black Death. It must have been a terrifying time, and it’s almost impossible to imagine what people must have felt about it. The early 1660s were much the same. The country had just endured two decades of internal turmoil, where first one side and then the other had the upper hand. No one really knew who was going to win or what was going to happen next, and the uncertainty must have been deeply unsettling. Both were periods of tremendous instability and change. I think that’s what attracted me to them. Do you find your experience as a police officer has helped you in your writing? I wasn’t in the West Yorkshire Metropolitan Police for many years, but I always felt it was like doing a sort of national service. I joined just after I left university, so it was my first ‘proper’ job. It was very different, and I think it helped me to grow up. I suppose it has helped my writing. It taught me a lot about people and the varied lives they lead. And about crime, too. It showed me the depths to which people will plunge, but I also witnessed astonishing acts of kindness and generosity. Are you able to write all the time or do you still have a day job? I am still a Research Associate of the Scott Polar Research Institute at the University of Cambridge, and my College is still Hughes Hall. Writing does take up the major part of my working day, though – and if not writing, then doing the research, which is an on-going process. There’s always more to learn, and the more I read, the more I realise I don’t know. How do you do your research? Writing several books about each period must mean you can re-use some of your knowledge or do you keep finding new sources? Research is an on-going process, as I said, and I’m always reading books on both periods – and re-reading them, as details I learned ten years ago haven’t necessarily stuck! New sources crop up all the time, and the internet can be helpful. For example, British History Online has some brilliant stuff, including John Thurloe’s State Papers and the Victoria County Histories. However, a lot of the information on the web isn’t peer reviewed, and so needs to be treated with extreme caution. I’ve found quite a number of mistakes, which have been perpetuated as one site copies from another – so you get 20 sites, all telling you the wrong thing. Therefore, I try only to use primary sources from the web. The rest comes from good old-fashioned books. Why do you write historical fiction and would you ever write a contemporary novel? That’s a really hard question to answer! I suppose I just feel at home with historical fiction now, after so many years. I did write a contemporary short story once for one of Mike Ashley’s ‘Mammoth’ books. It was about scientists in Antarctica, and I struggled quite hard with the dialogue. I couldn’t seem to make it sound natural, and the characters all sounded like they had just stepped out of a Famous Five book – The Famous Five and the Antarctica Murders. When you use a real historical character do you embellish their personality beyond what is known about them? Oh, yes, certainly! It’s quite hard to gain an impression of most people in the fourteenth century, as the primary sources tended to report what they did, rather than what they were like. Kings, queens and nobles are easier, because there have usually been decent biographies of them and contemporary chroniclers sometimes did give a description of their physical attributes and personalities, but many of my characters for Bartholomew come from Emden’s Biographical Register of the University of Cambridge, which is essentially just a list of references from charters and wills. I sometimes feel a bit guilty when I take the name of some hapless monk, friar or clerk and turn him into a sly and deadly scoundrel. The seventeenth century is easier, because it was a generally more literate society and so more was written down. Moreover, the authors weren’t all clerics, as they would have been in medieval times. Lots of people had much to say about, for example, men like the Earl of Clarendon, Sir Joseph Williamson (who ran the country’s intelligence network) and Sir George Downing (ambassador to the Dutch, whose name is commemorated in Downing Street in London). Downing in particular was disliked by his contemporaries as being sly, self-serving and ruthless, and these are great qualities for a villain in a novel. Given the constraints for women in the past, how do you deal with this to please the modern reader? It’s a bit of a beast, actually. So is religion, which would have played a major part in everyone’s lives in both periods. It’s a question of balance – trying to show what it would really have been like, tempered with a bit of twenty-first century tolerance. Otherwise, our characters would be so objectionable that no modern audience would empathise with them. What are the advantages and disadvantages of writing stand-alone novels as opposed to a series? I’m not really qualified to answer this, as I’ve only ever written one stand-alone (The Nimrod Murders, which my husband and I wrote as Simon Beaufort). However, the main danger with a series is that you might forget a detail and contradict yourself in the future. I would probably find countless incidents if I re-read my books, which is why I’ve never done it. Where do you write and do you have any established rituals to help you? I write in my study at home, a converted bedroom, with a fabulous view across the Welsh hills, towards the Brecon Beacons. My neighbour is often in the field outside my window, training his sheepdogs – he has represented Wales in international competitions, and is a joy to watch – and I can observe the changing seasons in the trees across the valley. It’s a wonderful place to work. I have more of a routine than established rituals. I try to be at my desk before 9 AM, and I have set breaks, when I meet my husband – who’s also a writer, and whose office is downstairs – for coffee and meals. We also have three chickens (spoiled rotten), so going out to give them their food and various treats provides a spell in the fresh air as well as a chance away from the computer screen. Does writing still excite you? Yes, generally speaking. There are bits of the process I like less than others – for example, I don’t really enjoy the first major edit after I’ve written the preliminary draft. It always takes ages and is really hard work. 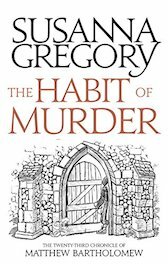 Do you think you will stick with murder mysteries or might you ever change genre? Hmm. Another hard one. Mysteries, for now, I think. But who knows what the future might hold? 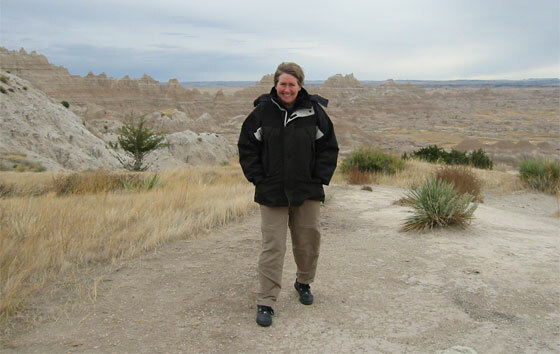 Susanna in the Badlands National Park in South Dakota. 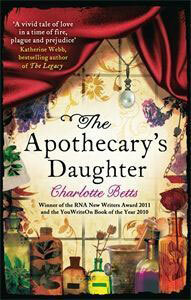 And for those folks interested in knowing more about Charlotte and her books, click here to go to her website.